Quilting is easier with a quality pattern. A great pattern lets you move beyond the worry of how the pieces will go together and focus instead on showcasing your favorite fabrics. The following printable designs will help you unleash your creativity. 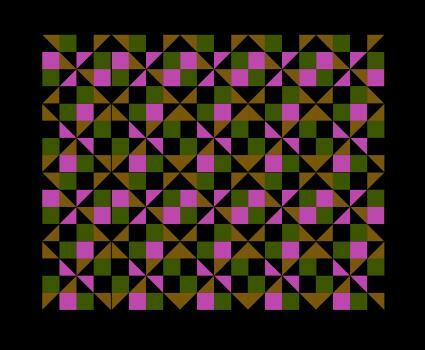 These patterns are easy to download. Simply click on the image of the pattern you want, and when you get to the image page, click 'save image as' and save the image as a JPG file with your desired file name to the folder or location you wish on your computer. 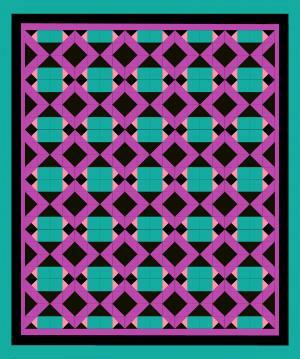 After you download the pattern, you can then resize it for your planned quilt. You can do this on your computer or use a copy machine to get the job done quickly. Either way, take a few minutes to decide how many blocks you want to make and the size of the finished quilt you have in mind. One way to do this is to measure a finished quilt you like and then divide the measurement by the number of blocks you'd like in width and length. That way, you will find out the dimensions you'll need for each block. Next, you'll need to take the printed pattern and cut it apart on the seam lines. Use double-sided tape to affix each pattern piece to a plain sheet of white paper. Use a ruler to create a seam allowance around each piece. Typically, this will be 1/4 inch, but you can adjust to suit your preference. Cut the pattern out on the seam allowance lines and use this to cut your fabric. Once you've printed the pattern in your desired size and added the seam allowance, you can begin using it to cut the fabric. One simple way to do this is to trace the pattern pieces onto stiff cardboard, giving you a more durable pattern piece. 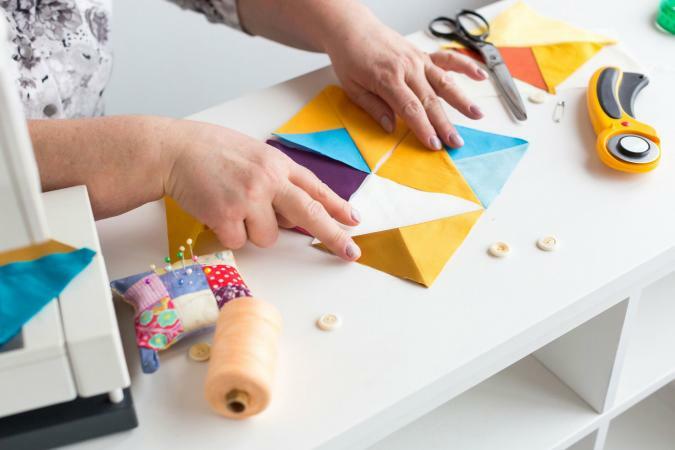 You can then use a rotary cutter and ruler to cut along the pattern edges, or you can trace the cardboard onto the fabric with a dressmaker's pencil and cut it out with scissors. The following patterns are versatile enough that you can use them to make a simple or complex design, depending on your tastes and skill level. No matter which one you choose, you'll have a great time creating something gorgeous. Because of its simple design, this pattern lets you show off one bright fabric amid some darker, less complex materials. The center pinwheel design, made of triangles, is surrounded by more triangles and squares to add a sense of modern style to the block. This design is also very scalable. 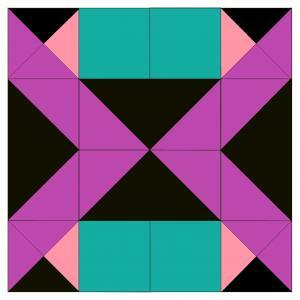 You can make a simple baby quilt by creating one big square 36 inches wide by 36 inches long. Alternatively, you can sew dozens of smaller squares together to create a work of art that will become the focal point of any bedroom. Add a dark border if you wish to create a frame for the design. If you love reading as much as quilting or if you need to make a gift for the bibliophile in your life, this bookshelf square is a great choice. 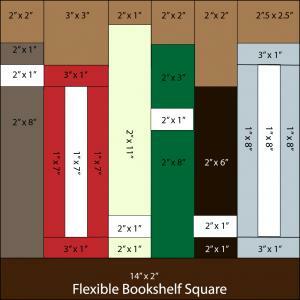 You can make a single 14-inch by 14-inch square into a pillow, or you can combine lots of squares to make the shelves. This design also lets you show off some pretty colored fabrics, set against the brown background of the "bookshelf." One fun way to personalize this design is to embroider the titles of favorite books on the spines. You can choose kids' books, classics, or any other type of title. Make this in a throw size to decorate your reading nook by sewing four blocks across and five blocks tall. The bright square is a great choice for creating modern, graphic designs with lots of options for combining blocks. It's also a good way to showcase a couple of lovely fabrics against a solid or simple background. Size this block according to your needs, using fewer, larger blocks if you would like to do less piecing. 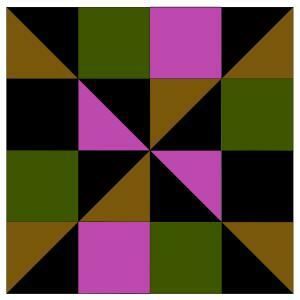 You could make a simple throw-sized quilt with six 24-inch squares, using two across and three down. Alternatively, you could make a bed-sized quilt with lots of smaller blocks. How you arrange the blocks is also up to you. You can sew them in straight rows to create a diamond box pattern for the quilt, or you could stagger the blocks to make zig-zags. Completing your quilt is also about your personal preference. You can sew strips around the edges to make a border, or you can simply quilt or tie the top and sew binding around the edges to finish them. Using a great pattern lets you focus on the details you want to while knowing the finished quilt will be lovely.